Big Fish Stories Getting Littler : Krulwich Wonders... She found them in the Key West library: an old stash of "Look at What I Caught!" 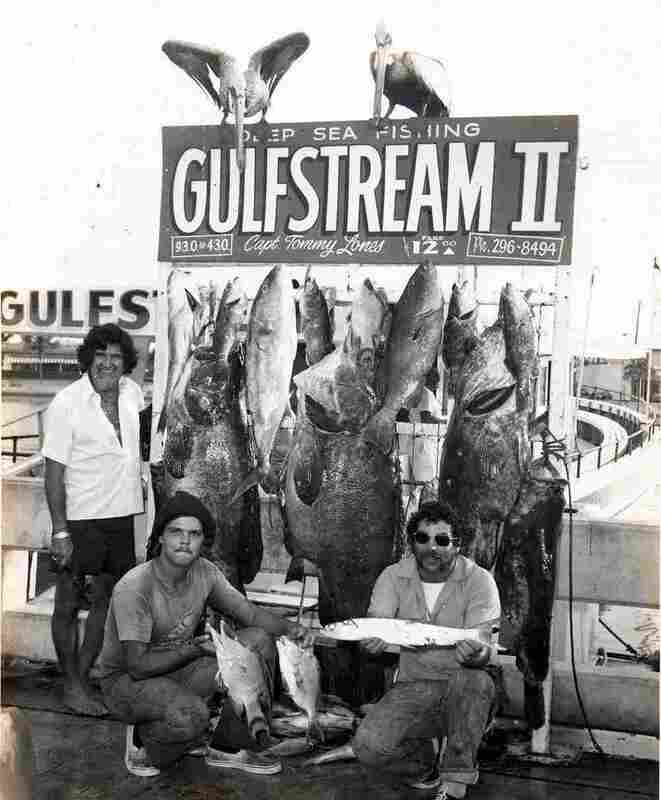 photos, proud fishermen showing off their big catch of the day back in the 1950s, '60s, '80s. As she looked, she noticed something odd. Something important. They came, they fished, then snap! They posed. Right in front of their Big Catch — and thereby hangs a tale. For generations, tour boats have been collecting fishing enthusiasts in Key West, Fla.: taking them for a day of deep sea casting; providing them rods, bait, companionship; and then, when the day ends, there's a little wharf-side ceremony. 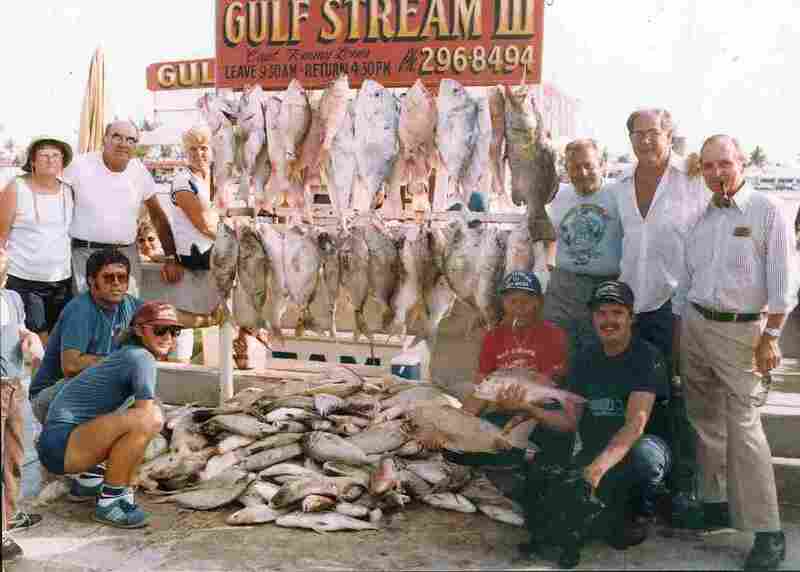 Everyone is invited to take his biggest fish and hook it onto the "Hanging Board"; a judge compares catches, chooses a champion, and then the family that caught the biggest fish poses for a photograph. The one up above comes from 1958. 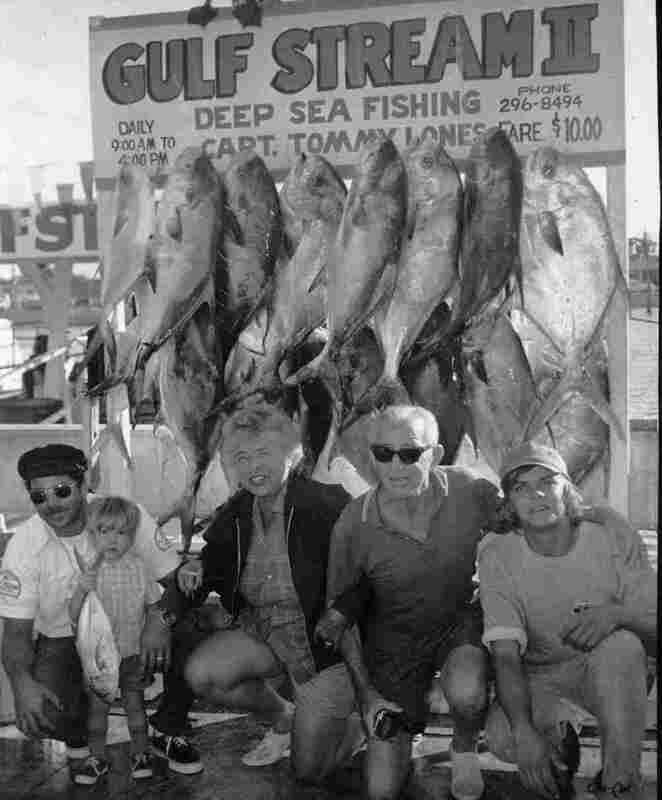 Notice that the fish on the far left is bigger than the guy who, I assume, caught it; and their little girl is smaller than most of the "biggies" on the board. Those aren't little people. Those are big fish. Here's another one from the year before — 1957. Again, the fish loom larger than the people. Check out the guy in the back, standing on the extreme right, next to an even bigger giant. Charter companies have been taking these photos for at least 50 years now. 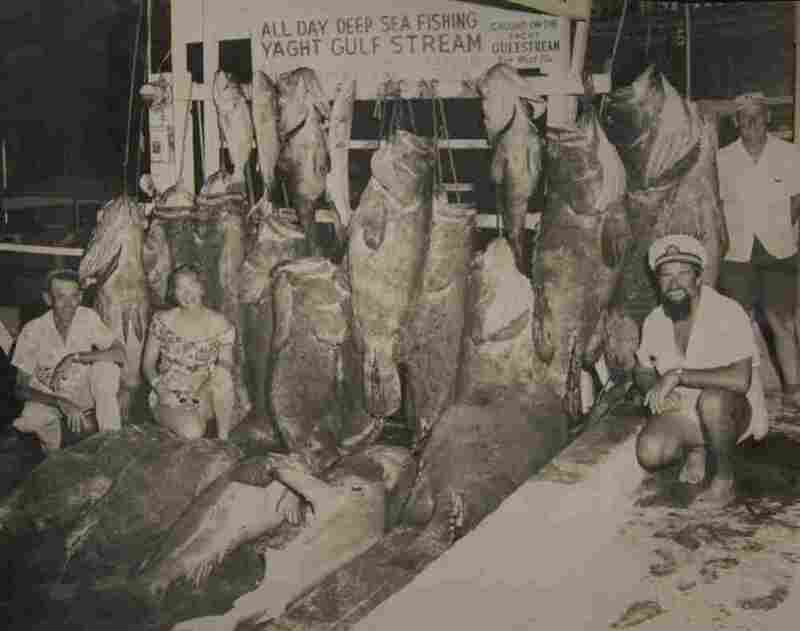 In some cases, they've operated from the same dock, fished in the same waters and returned to the same Hanging Board for all that time — which is why, when a grad student working on her doctoral thesis found a thick stack of these photos in Key West's Monroe County Library, she got very excited. Loren McClenachan figured she could use this parade of biggies to compare fish over time. ... the biggest fish were averaging only a foot, or maybe a little over. That's a staggering change. The biggest fish on display in 2007 was a shark, and sharks, Loren calculated, are now half the size they used to be in the '50s. As to weight, she figured the average prizewinner dropped from nearly 43.8 pounds to a measly 5 pounds — an 88 percent drop. It's no big surprise, I suppose, that fish in the sea are getting smaller. The curious thing, though, is that people who pay 40 bucks to go fishing off Key West today have no sense of what it used to be like. 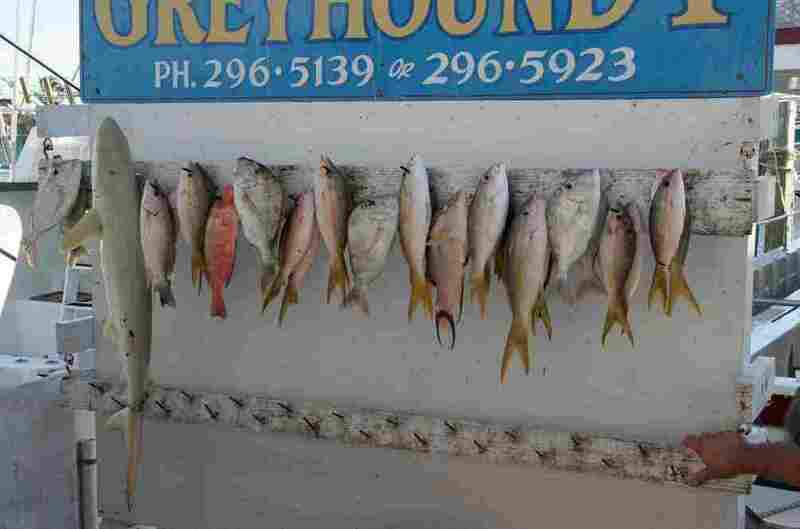 Had Loren not found the fish photos, there would be no images, no comparative record of what used to be a routine catch. 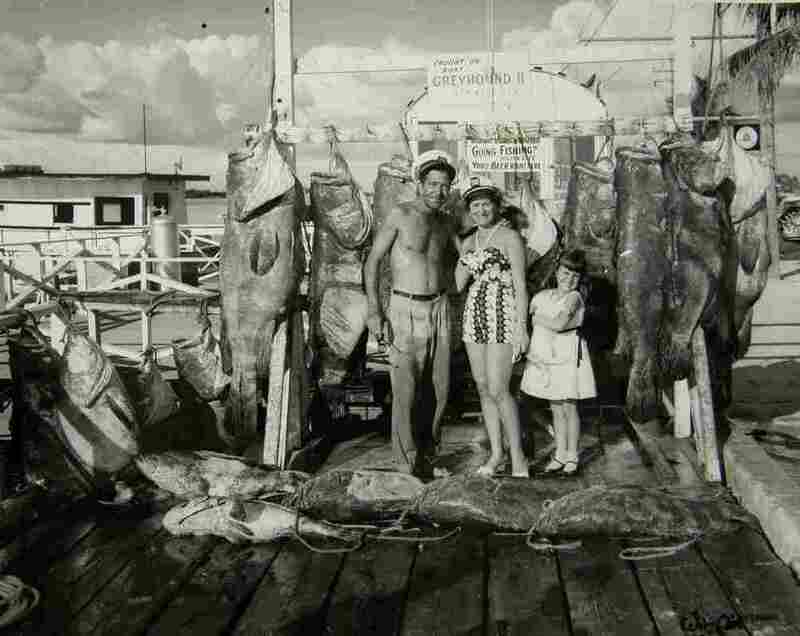 In her paper, Loren says that the fishing charter tours are still very popular. The price of the tour hasn't dropped (adjusting for inflation), only the size of the fish. Looking at the photos, people now seem just as pleased to be champions as those "champs" back in the '50s, unaware that what's big now would have been thrown away then. Loren says she suspects that people just erase the past "and will continue to fish while marine ecosystems undergo extreme changes." Daniel Pauly, a professor at the University of British Columbia, has a way of describing these acts of creeping amnesia. He calls the condition "shifting baseline syndrome," and while he was talking about marine biologists' failure to see drastic changes in fish sizes over time, it's a bigger, deeper idea. When you're young, you look at the world and think what you see has been that way for a long time. When you're 5, everything feels "normal." When things change in your lifetime, you may regret what has changed, but for your children, born 30 years later into a more diminished world, what they see at 5 becomes their new "normal," and so, over time, "normal" is constantly being redefined to mean "less." And people who don't believe that the past was so different from the present might have what could be called "change blindness blindness." Because these changes happen slowly, over a human lifetime, they never startle. They just tiptoe silently along, helping us all adjust to a smaller, shrunken world. Professor Pauly has noticed that we are now consuming more small fish today than we did 50 years ago. Cod, swordfish and tuna are gradually giving way to herring, sardines, menhaden and anchovies. He was recently quoted as saying, "We are eating bait and moving on to jellyfish and plankton," and soon kids will be giving up tuna fish sandwiches for jellyfish sandwiches. Sounds crazy, I know, but then I happened to notice a story about the cannonball jellyfish (Stomolophus meleagris), found off Florida in the Gulf of Mexico. It is now being harvested for human consumption. U.S. fisheries have opened to catch those jellyfish, mostly to send off to Asia, but hey, I'm sure there's some marketing guy imagining peanut butter and jellyfish snacks. In fact — and I kid you not — at the Dallas aquarium, they are feeding real jellyfish peanut butter, and the jellies seem to like it. So already we've got jellies with just a hint of peanut living in Texas. Can the "New P & J" be far behind?